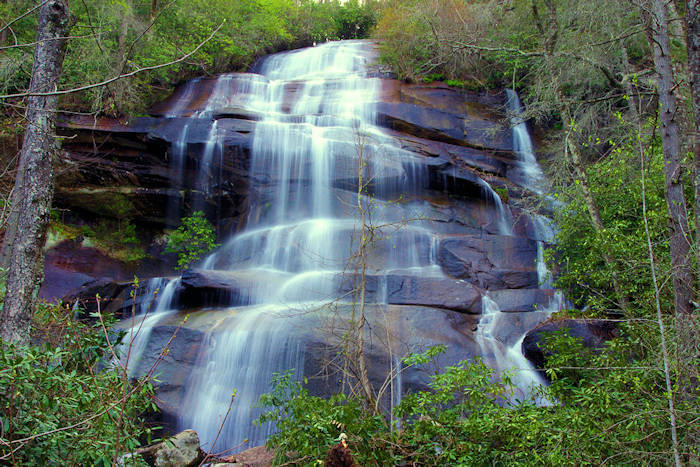 Slick Rock Falls is a 35-foot waterfall in Pisgah National Forest that cascades across an overhanging cliff. It's most impressive after some good rains. During dry periods it reduces to a trickle. On a hot day, it's refreshing to stand underneath or walk behind (be very careful of the slick rocks). In winter, find great ice formations. Slick Rock is easy to find, and it's a short walk from the parking area. 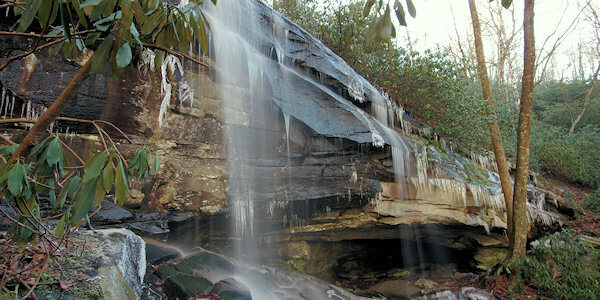 The falls is named for the slick rocks at the top and bottom of the falls. 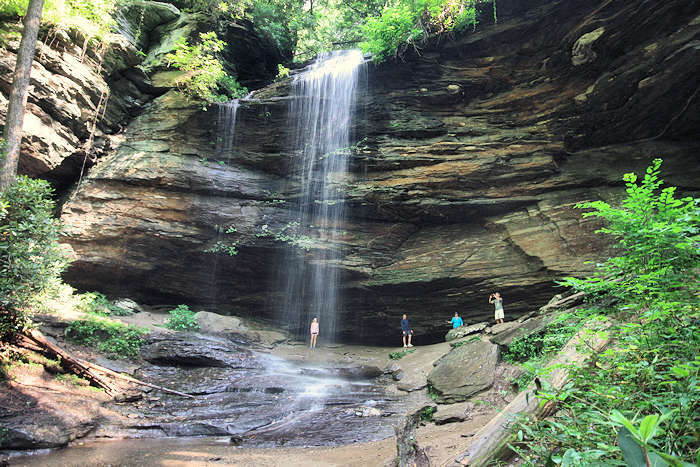 Before becoming a part of the Pisgah National Forest, a cattle trail crossed Slick Rock Creek near the top of the falls, and occasionally, a stray animal would be carried over the falls. The Slick Rock Falls Trail (about 3/4 mile) starts here - a popular route for rock climbers going to the South Face of Looking Glass Rock. There are many other great hikes and waterfalls nearby. If you like driving through the forest (car hiking! ), continue on one-laned, unpaved FR475B for four miles to see two waterfalls on Log Hollow Branch. Then drive for another 1.5 miles to reach US 276 again. 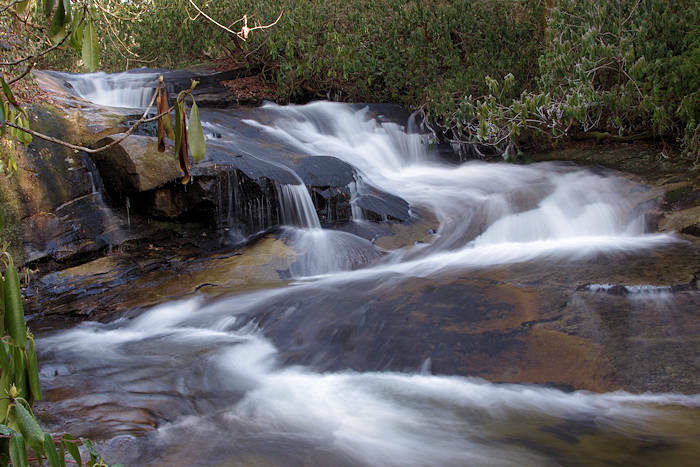 Turn right on US 276 to drive by Looking Glass Falls, Sliding Rock and return to Brevard. Turn left on US 276 to reach the Blue Ridge Parkway. 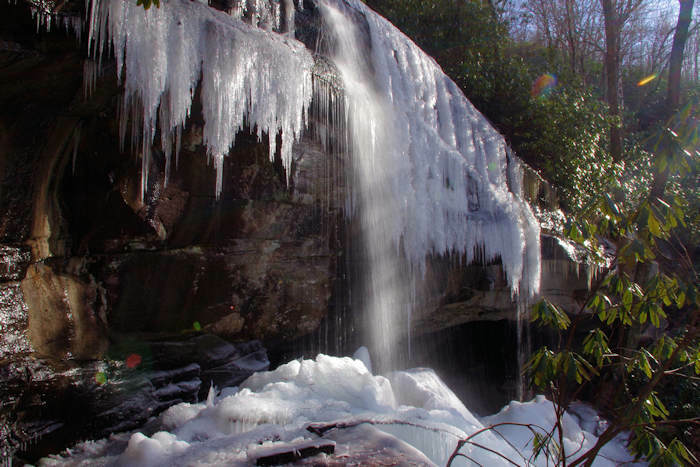 The hikes to Cove Creek Falls and Daniel Ridge Falls are just a few miles away. Also nearby are hikes to Looking Glass Rock and John Rock. 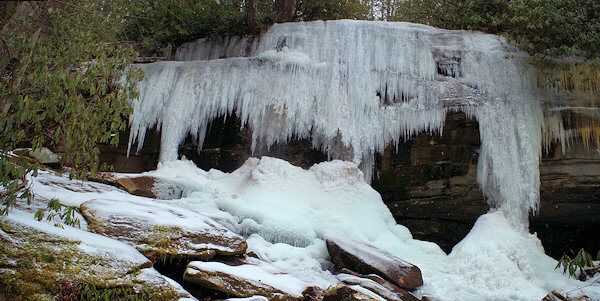 This is a great waterfall to see in the winter since the low flow of water creates amazing ice formations. However, the road often closes due to severe winter weather. If it's closed, you'll have to hike the final 1.1 miles. Directions from Downtown Asheville (about 40 miles): Take I-240 West / I-26 East. Continue on I-26 East to Exit 40 for Highway 280 (and the Asheville Airport). Take a right onto Highway 280 West and go 16 miles toward Brevard. As you enter the Brevard area, you will see a big shopping center on the right (with Wal-Mart). Just past the center, turn right onto US Highway 276 North (Forest Heritage Scenic Byway) to enter the Pisgah National Forest. Go 5.3 miles and turn left at the sign for Pisgah Center for Wildlife Education and the State Fish Hatchery. Go 1.5 miles to Forest Road 475B on the right. Turn and drive 1.1 miles on this unpaved, one-lane road to an obvious small pull-off on the right. You'll see a bulletin board and can usually hear the waterfall. The address for the nearby Pisgah Center for Wildlife Education is 1401 Fish Hatchery Rd, Pisgah Forest, NC 28768.